#ThisGirlGolfs Campaign is trying to change the perception that golf is just a man's game. My Taid is a big golf lover and has played Golf for many years. He used to love taking me to the local golf range when I was younger, but I never got myself interested to carry on as I grew older. I'm not sure why it didn't interest me though. My Nain started to play golf a few years ago and went a few days a week. She really enjoyed it but had to stop because she struggled to play in the end due to health. 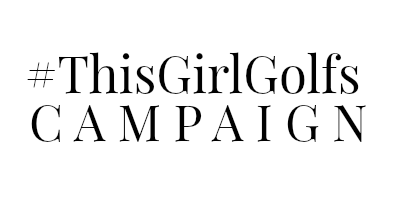 #ThisGirlGolfs Campaign is being supported by The PGA, England Golf and SGU. Sports Publications has driven, managed and delivered the campaign. Golf is a game for men and women, and is a game that anyone can play and compete with each other. You can take golf seriously and you could also play golf as just a hobby. Golf coursers are on big ground with beautiful views. There are great female golf players, such as Charley Hull, Laura Davies, Mel Reid and Paula Creamer. Despite there being great golf players out there only 13% of English golfers are female and 14% are affiliated members of England Golf. In Germany only 38% of golfers are female; in France 28% and only 29% in Sweden Golf is still made out to be a man's game. When golf comes on TV I always see men playing, never women. It would be nice for there to be a mix or even a women's game too. - Since 2004, female membership has fallen by 27% at English golf clubs. - On average, there are 70 women members in each club in England. - There was a survey taken in 2014 (Syngenta - 'The Opportunity to Grow Golf: Female Participation') where 640,000 said they were interested in taking up golf. - 88,700 females play golf at least once a week. - 146,300 play once a month. - The average age of a female golfer playing once a week in England is 50. It is a shame that the average age of a female golfer (in England) is 50 years old as it would be nice to see the younger generation get more involved. There are so many benefits for playing golf. You play golf outside so you get fresh-air whilst you play and it's a stress-busting exercise and camaraderie can help promote long term heart health. If you are trying to loose weight, stay fit and healthy then golf is a great game to play. It can help you keep active, burn those calories, lower cholesterol, stay in shape and reduce the risk of heart disease, cut your risk of stroke, diabetes and reduce blood pressure. Even better if you combine with a healthy diet and lifestyle. Golf is great for burning those calories! Something most women these days want to do. If you play an 18 hole game you will burn at least 900 calories and walked over 10,000 steps which then you will have achieved the recommended 150 minutes of moderate exercise a week recommended by the NHS to keep healthy. Golf can be a fun game where you can socialize and meet new people. You can see more about #ThisGirlGolfs Campaign here. Are you a female golfer? Have you ever been interested in golf? If not, has this post interested you to consider playing? I'd love to know.